Mary-Lu Zahalan-Kennedy is a trailblazer of sorts. Not only is she a former Miss Canada finalist, she’s also one of the first 12 students in the world to enroll in Liverpool Hope University’s unusual masters degree program specializing in Brit Pop band The Beatles. 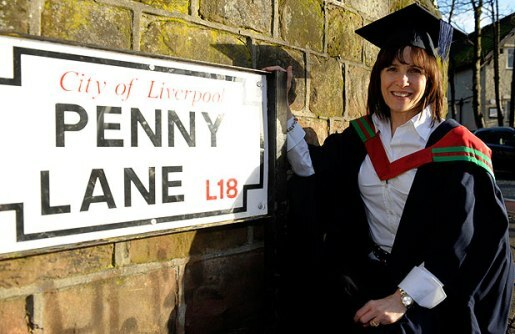 Mary-Lu Zahalan-Kennedy has a masters degree in Beatles, Popular Music, and Society, making her the first person in the world to have a masters degree in The Beatles. “I am so proud of my achievement,” said newly-minted MA Zahalan-Kennedy. “The course was challenging, enjoyable, and it provided a great insight into the impact the Beatles had and still have to this day across all aspects of life.” Ms. Zalahan-Kennedy started the program in 2009, when the program itself was founded. “Mary-Lu now joins an internationally recognized group of scholars of Popular Music Studies who are able to offer fresh and thought-provoking insights into the discipline of musicology,” said professor Mike Brocken, the founder of The Beatles MA program at Liverpool Hope. And they say college isn’t worth what it used to be.